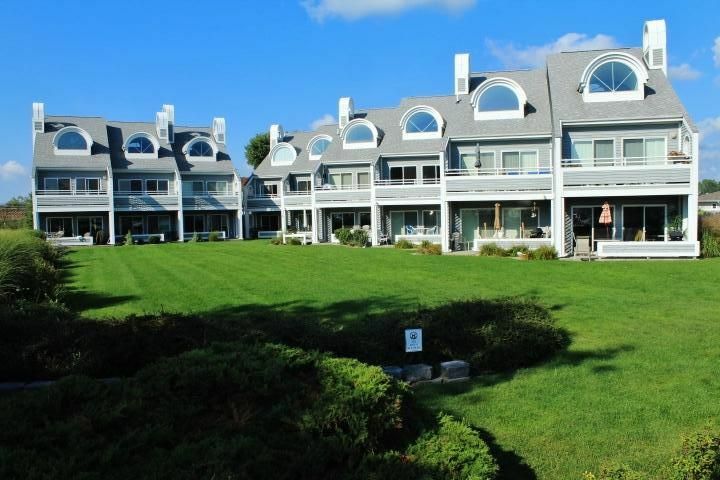 Beautiful contemporary Mill Point Condo, adjacent to the Spring Lake Holiday Inn. View luxurious water traffic from your own patio, while enjoying your outdoor bar. Stroll next door to the Holiday where fine dining, entertainment, and a lively Tiki Bar are just steps from your own private condo. Enjoy sunsets at the beach at Grand Haven State Park, and the world famous musical fountain, only minutes away. BR B Amenities: /B BR Mill Point condo includes 1 Bedroom with Queen Bed, as well as a Queen Sleeper Sofa in living room. Unit sleeps 4. Fully furnished with washer/dryer, microwave, A/C, 2 cable TVs, linens, carport, and Tiki Bar on patio. BR B Activities: /B BR Swimming, fishing, charter boat rental, protected walkway for biking, roller blading, and walking available at Mill Point Condo. Windsurfing, beach activities, specialty shopping, fine dining, and pier sunset minutes away at Grand Haven State Park. Musical fountain show nightly, waterfront in Grand Haven. Discounted fall/winter 30 nights, 9/1/19-5/31/20. $1,050/30 days. Cleaning fee: $125. All bed linens and pillows for queen bed and sofa sleeper provided. Apartment size washer/dryer in unit. All bath and kitchen towels provided. Coffee maker and filters provided. Dishes and utensils available for 8. Contains refrigerator, Gen-Air stove, microwave, and dish washer. Cable TV in livingroom & bedroom. Transient boat slips available for rent from Holiday Isl Marina directly in front of Mill Point Condo. Was such a pleasure staying in this Spring Lake condo. It was very clean and updated, close to all the Grand Haven activities. The pool is very lovely too! Thanks so much. Glad you enjoyed your stay at the condo, & the pool. The Spring Lake/Grand Haven area is the best. Would love to have you visit again. The location was perfect, right on the dock. The condo was tired and needed updating. The kitchen and bathroom although very clean, needed to be replaced. The owner was easy to work with. Great location, cozy and comfy. Second year here and we will be back. Sandee is the best and excellent to work with. Thanks so much. Glad you enjoyed the condo & area as much as I do. Great little place in a great location! The Tri-Cities offers a ton of options! We had a great time in this condo and loved the access to biking/walking paths, water views, the Holiday Inn pool, and all the fun in the area. Spring Lake now has three breweries! Who would've thought it? The condo itself was clean, well appointed, and had plenty of room for us to have guests over, serve dinner and be comfortable. Sandee was always available for us if we had any questions (we only had a couple). Kick back and enjoy your time in Spring Lake. We certainly did. Thanks Al. Glad you enjoyed the condo, & the Spring Lake/Grand Haven area. It is a truly unique place. Come visit again soon. Overall, a very nice stay. Nice, clean condo on a marina. Pros: easy to find, right on the water, felt safe, walking distance to the Holiday Inn for hot tub, pool, brewery, etc. Close to downtown Grand Haven. First floor so we could bring in groceries easily, play in the "backyard." Laundry right in the kitchen so easy access. Nice water pressure. Dishwasher! Sheets were a high thread count... this is very important to me. Owner left us a gift basket with my favorite bottle of wine. The patio area was a nice feature. Open kitchen to the family room. The kids could sit at the counter as I made them breakfast, lunch, and dinner. Enough pots, pans, plates, etc. so I could actually cook. A nice little selection of books for vacation-type reading. This is something I had forgotten to bring. Cons: the sofa bed is extremely uncomfortable, even with the foam mattress topper provided. My back hurt for a week afterwards. The bed in the bedroom was extremely comfortable, though. The air conditioner had a broken compressor for the first three days of the stay. When we let the owner know, she was responsive and sent someone right away to fix it. Stayed here in mid-July 2016 for three nights. Very well maintained condo. Convenient to downtown and local restaurants. Waterfront is a beautiful setting. Ideal for a two people (couple), maybe one more on fold-out couch. Kitchen has basic stock of dishes, pots, pans, silverware, glassware, etc. Bedding and towels provided, but we brought our own just in case. Owner was very easy to work with. Neighbors were quiet and polite. Previous reviews mention uncomfortable mattress in bedroom. Mattress has been replaced - very comfy. Discounted monthly fall rates starting September. Refundable Security Deposit $200. Pets/Smoking Not Allowed. Cleaning Fee, $125. $200 security deposit with booking. Total Rental due 30 days prior to check-in.